When I began birding in the early 1970's, seeing an eagle—any eagle—was a very big deal. 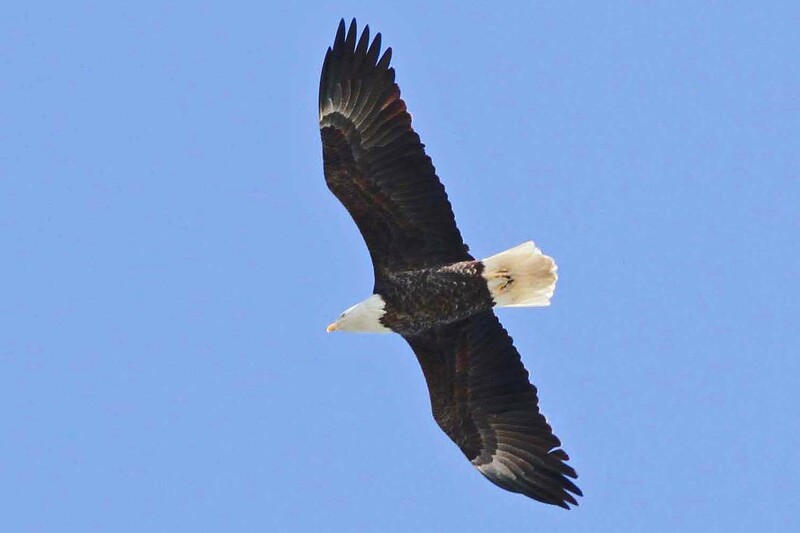 Owing to DDT, the Bald Eagle was on the brink of extinction in eastern North America. Short of heading west or to Alaska, seeing an eagle anywhere was a red letter day. 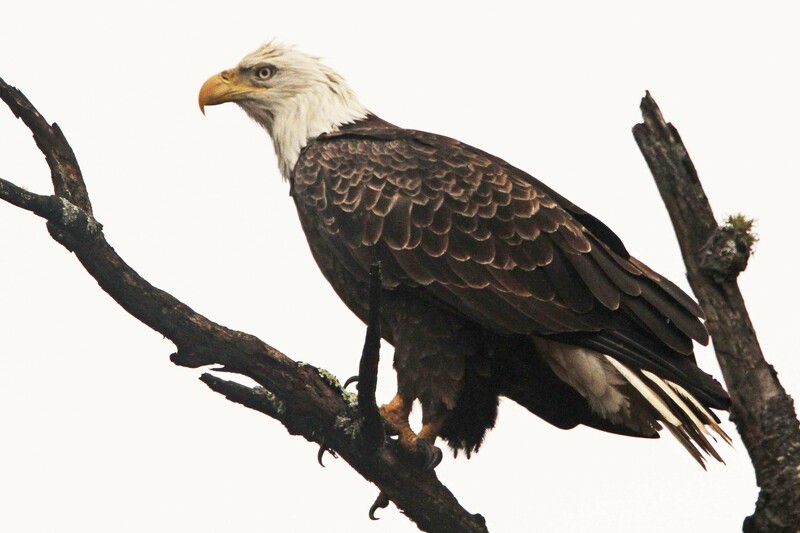 Times have changed and at least in the Carolinas, Bald Eagles have become almost common. 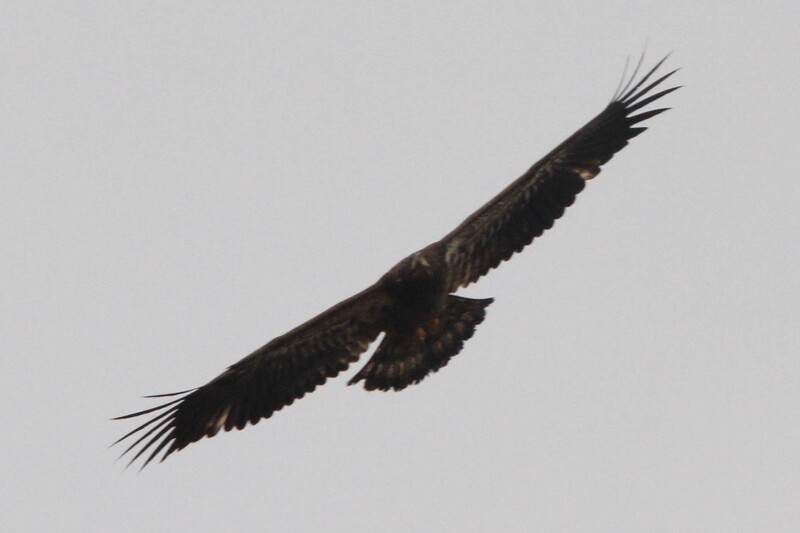 In addition, Golden Eagles, though rare, are being seen with increasing frequency. Of course that's a good thing. But, given the fact that eagles require 4–5 years to reach maturity and pass through many different plumage stages along the way, identification is not quite as simple as one might otherwise believe. Click on any image for full-size view. The term "eagle" loosely refers to a diverse group of large, diurnal raptors within three subfamilies, many genera and depending on your nomenclature, as many as 60 species. In North America north of Mexico, four species of two genera are known. Genus Haliaeetus, the sea eagles are represented by three species in North America and in the Carolinas by one: the Bald Eagle. This species is endemic to North America (including northern Mexico) and forms a species pair with the larger White-tailed Eagle of Europe and Asia. 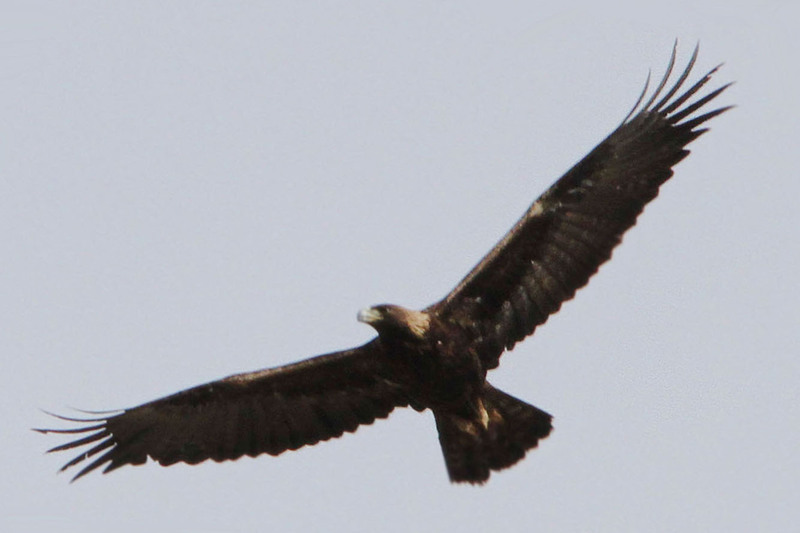 Genus Aquila, the true eagles, characterized by feathered tarsi, is represented in North America including the Carolinas by a single species: the Golden Eagle. But unlike Bald Eagles which are endemic to our continent, Golden Eagles enjoy worldwide distribution including North America, Europe, Africa and Asia. BALD EAGLE (Haliaeetus leucocephalus): This species is represented by two subspecies. The nominate form or Southern Bald Eagle (H. l. leucocephalus) occurs primarily throughout the southern United States and Mexico and is the resident form in the Carolinas. The larger Northern Bald Eagle (H. l. washingtonensis) breeds in the northern United States, Canada and Alaska and is migratory. 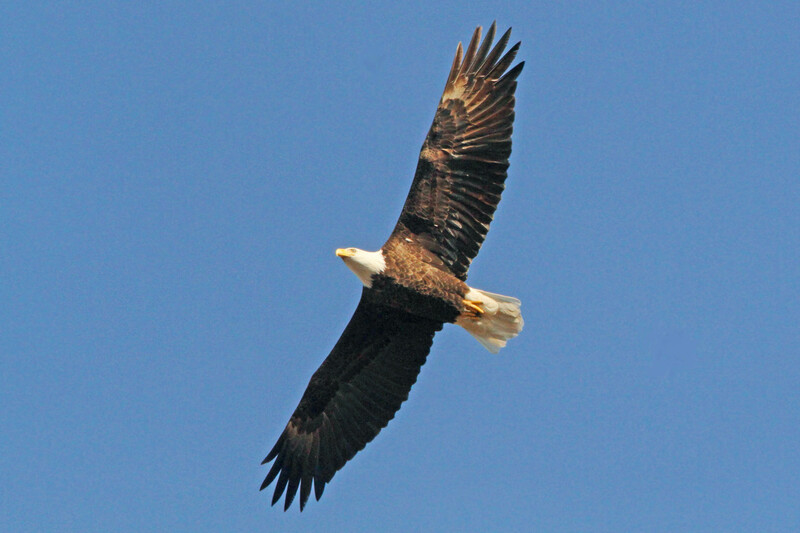 Thus, while summer Bald Eagles in the Carolinas are almost certainly the Southern form, both occur in winter. Except for breeding range and size, for which there is considerable overlap, the two forms are identical and indistinguishable from each other in the field. 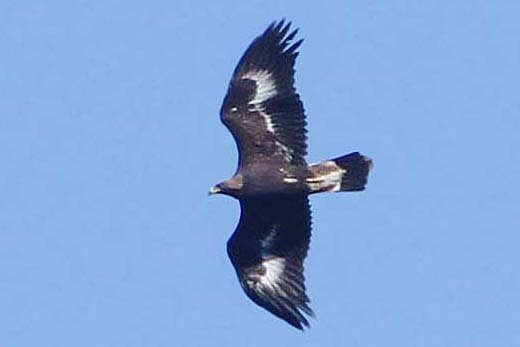 However, a winter season eagle seen in an area not normally occupied by resident birds would likely be a Northern bird. 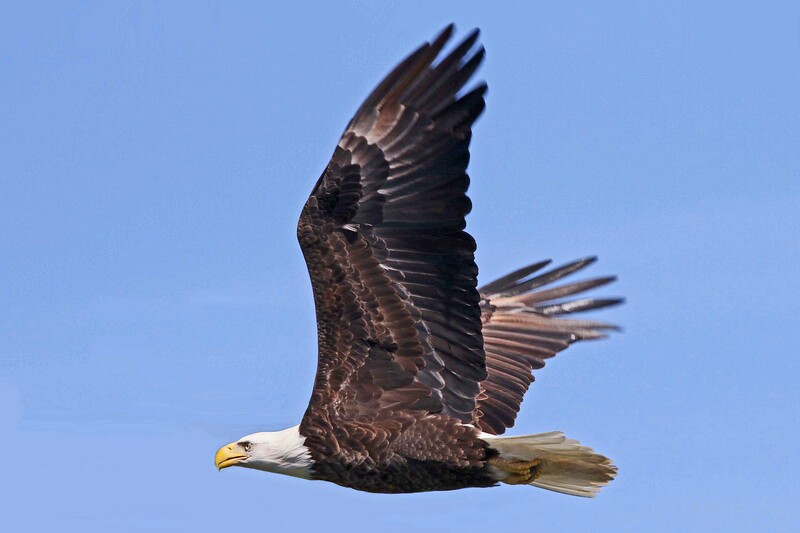 Adult: It's pretty hard to mistake a full adult Bald Eagle with its dark brown body and wings contrasting with a snow white head and tail including white under-tail coverts (Figure 1). At close range, the beak, eyes and feet are bright yellow (Figure 2). Benjamin Franklin's disparagements aside, it's a magnificent bird and a fitting symbol of the country. In flight, the wings are uniformly chocolate brown with leading and trailing edges that are relatively parallel (Figures 1, 3). 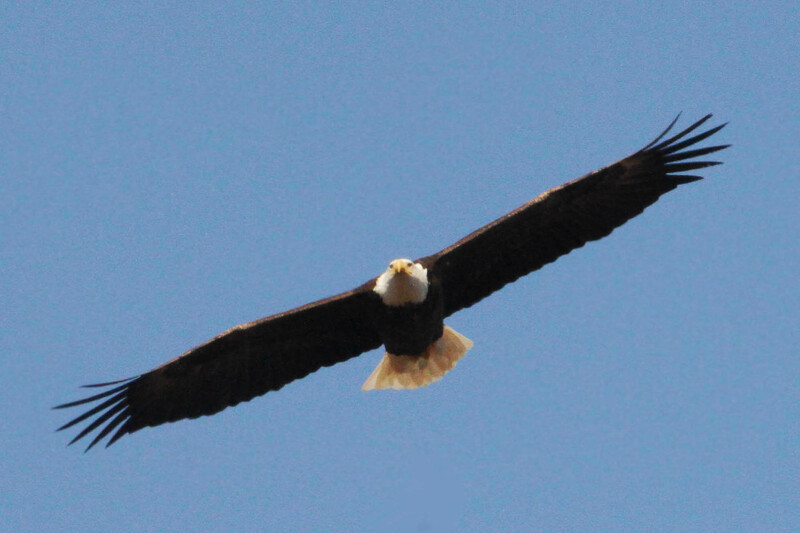 In gliding flight, Bald Eagles hold their wings very flat (Figure 4). 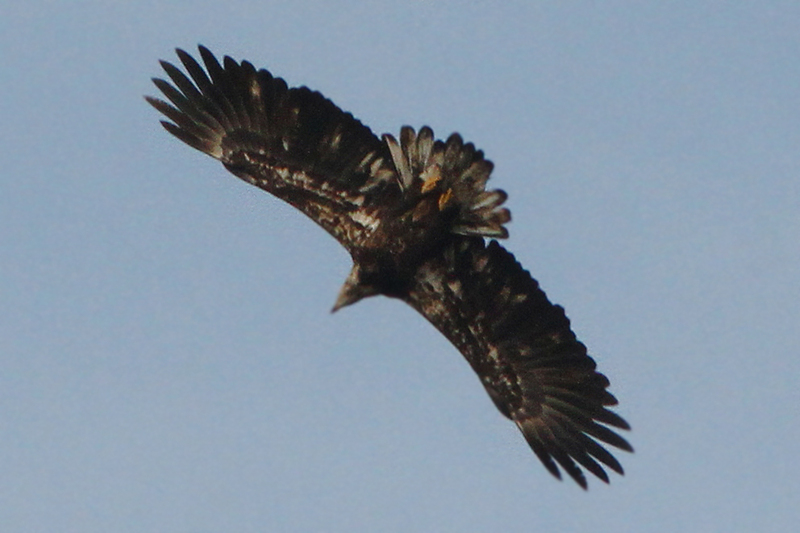 From juvenile through adult, Bald Eagles pass through multiple, often complex, age-related plumages. For our purposes here, we'll limit discussion to four cycles, roughly equating to the first four years of life. It's important, however to understand that these are approximations and not absolutes and anyone wishing to delve more fully into the plumage variations of this species are encouraged to read the literature regarding molt sequences and patterns. 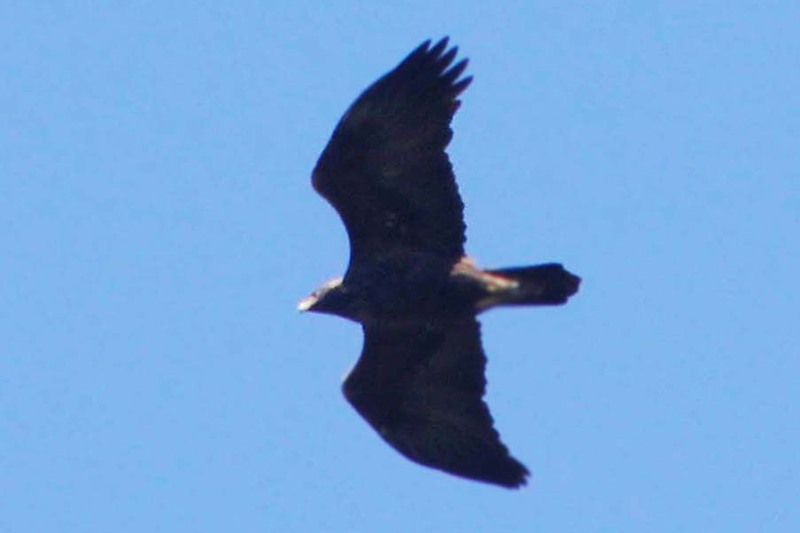 First Cycle (Juvenile plumage through end first year): The head and entire body are uniformly dark brown although the back and upper-wing coverts tend to be slightly lighter (Figure 5). The bill is black with a pale mouth gape. The legs are dull yellow and the tarsi unfeathered although seeing this in the field requires an extraordinarily close look. In flight, the underwings show mottled white wing linings and mottled darker flight feathers (Figure 6) whose degree of contrast is low owing to the lack of any strong line of demarcation. 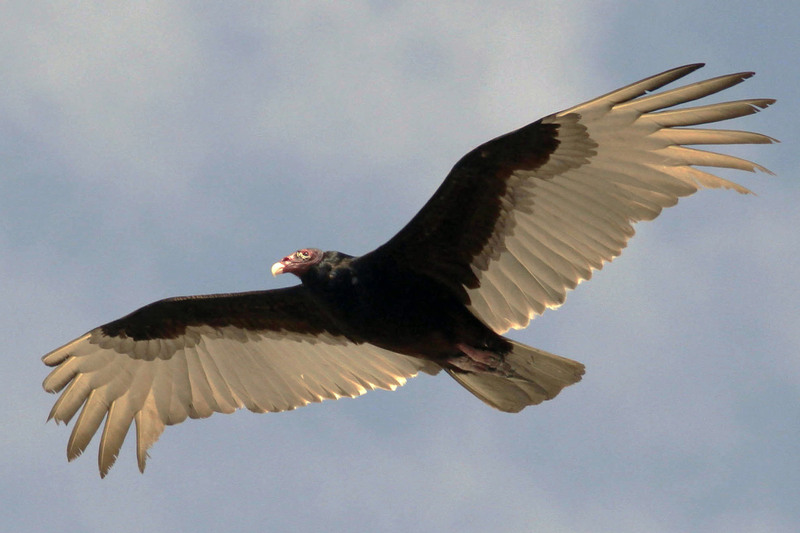 This pattern is opposite of a Turkey Vulture which has dark wing linings that strongly contrast with paler flight feathers (Figure 7). 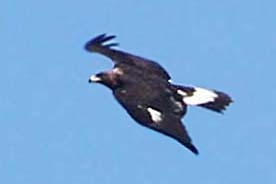 The eagle's tail is black with variable white mottling throughout but mostly along the basal 2/3 (Figure 8). While at times this tail pattern may be prominent, the white is always a "salt-and-pepper" pattern and never the bright solid white, sharply defined white against dark of a young Golden Eagle (see descriptions under that species). Compared with adult birds, the wing is noticeably wider and has a more convex trailing edge (Figures 3, 8 and 9). Also, the "fingers" (elongated notched outer primaries) are longer in front than in back, giving the wingtip a "front-heavy" appearance (Figure 9). Second Cycle (approximately two years old): This plumage is highly variable, but commonly pairs a dark head and chest with a heavily mottled, paler under-wing coverts and belly (Figure 10). At times, the underparts can appear predominantly white (Figure 11). In the molt from first to second cycle, the secondaries become shorter. Thus, molting birds show a jagged trailing edge caused by a combination of longer first cycle feathers and shorter second cycle feathers (Figure 12). The bill may start to show some yellow around the base but it will still be mostly black. Third Cycle (approximately three years old): The light belly of second cycle starts to darken while the head lightens. As the head begins its transition to white, there is commonly a residual dark band through and below the eye (Figure 13). As such, this is reminiscent of the head pattern of an Osprey (Figure 14). 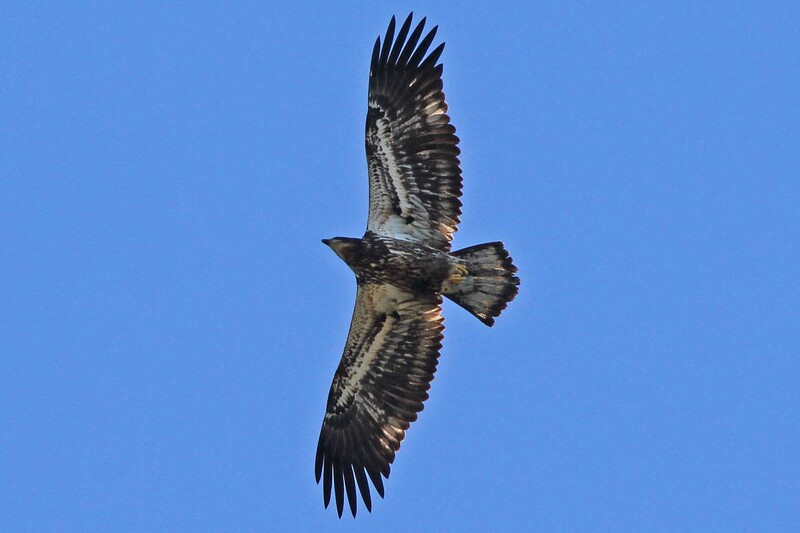 Some birds may retain a pale belly and dark chest which begins to contrast with the pale head, further increasing superficial similarity to Osprey but note the eagle's developing yellow beak as compared with the Osprey's solid black beak. Also, the eagle's lighter plumage areas remain strongly mottled and the underwings never show the Osprey's white with black carpal pattern (Figure 14). The molts from second to third cycle and again from third to fourth generate further narrowing of the wings. Thus molting birds in all these transition ages may show a ragged trailing edge (Figure 15). Finally, some birds in third cycle show a mottled white back (Figure 16). Fourth Cycle (approximately four years old): At a distance, these birds appear to be adults but on close inspection some flecks of dark brown in the head and tail are retained (Figure 17). The bill, though entirely yellow, commonly shows dusky patches and overall, is not as bright yellow as a full adult. 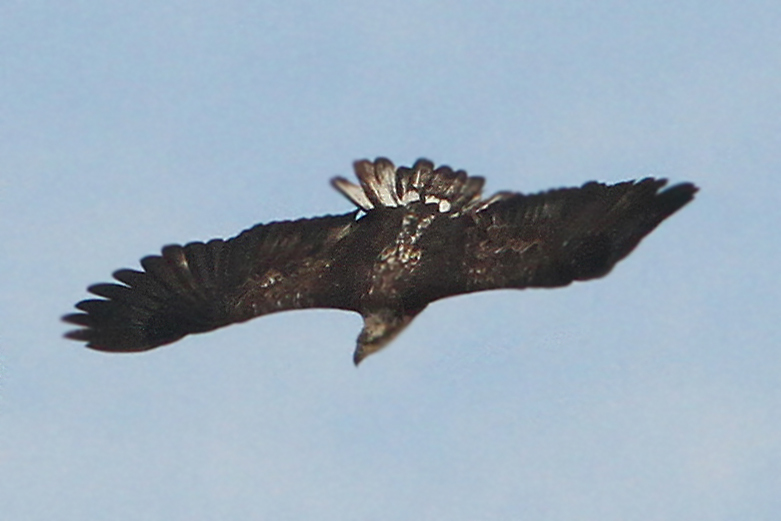 In flight, retained third cycle flight feathers continue to show a ragged trailing edge to the wing (Figure 18). 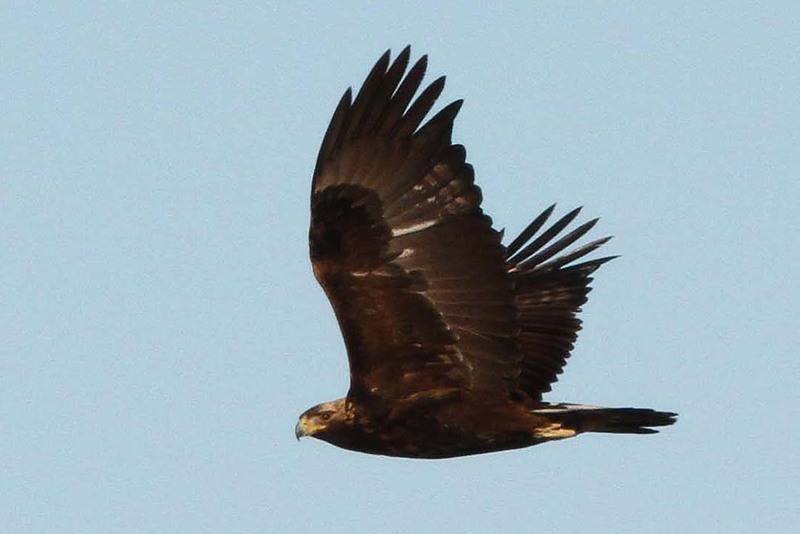 GOLDEN EAGLE (Aquila chrysaetos): Though much rarer in the Carolinas than Bald Eagle, this predominantly western species occurs regularly every year and sightings seem to be increasing. It's unclear, however, if that's due to population changes or increased coverage and reporting, or both. Like Bald Eagles, Golden Eagles require 4–5 years to reach full maturity but do not exhibit a comparable diversity of plumage. Fundamentally Golden Eagles can be understood by learning only three plumage variations which, herein will be referred to as "immature," "sub-adult" and "adult." In reality, these designations aren't quite accurate but for our purposes, it's adequate. 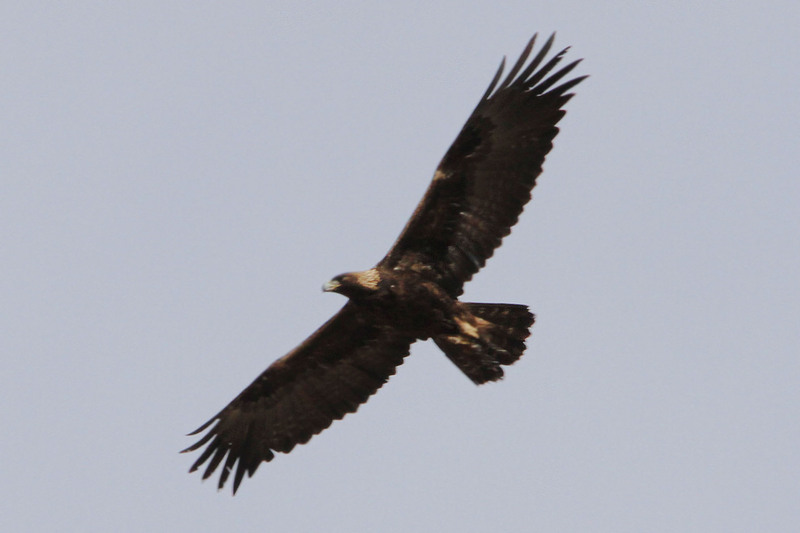 General: Even before details of plumage can be assessed, a Golden Eagle differs from Bald is a number of significant ways. First, the tail extension is nearly twice that of the head (Figure 19) where in Bald Eagle, they're roughly equal, although young Bald Eagles are longer-tailed than adults (compare Figures 1,3, 5 and 9). Next is the flight profile. 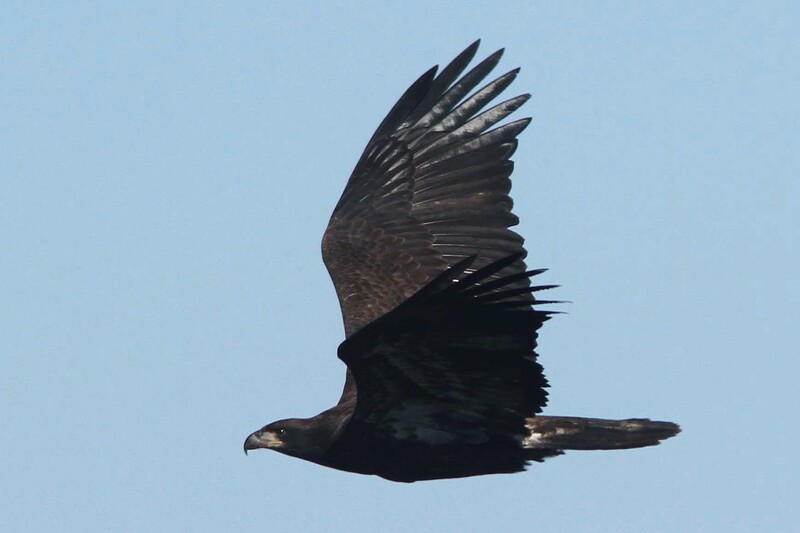 Where Bald Eagles fly on nearly board-flat wings (Figure 20), Golden Eagles soar with a slight dihedral (Figure 21) though not as pronounced as in Turkey Vulture (Figure 22). However, there is some variability with this so caution is warranted. But, the longer the period of gliding flight, the more reliable this difference becomes. 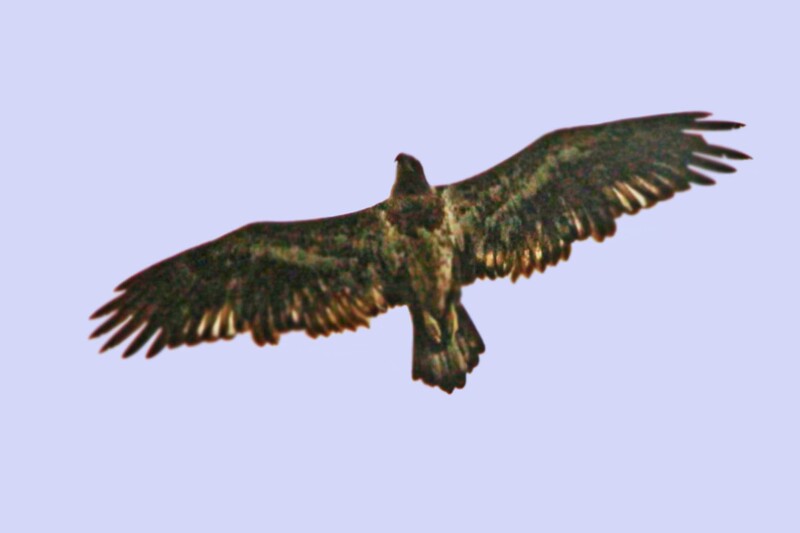 In protracted gliding flight, Golden Eagles commonly pull the "hand" back, creating a forward-projecting Buteo-like "kink" in the wing (Figure 23). While both species may either exhibit this or fly on fully extended wings, this pattern seems to be more common in Golden than Bald Eagles. Finally, a subtle difference in the transition from flapping to soaring flight exists. Golden Eagles commonly end their flapping sequence slightly below level and raise the wings up to level soaring whereas Bald Eagles end the flapping with a down-stroke to soaring. There is no upward adjustment. In all cases, these differences are subtle, can be variable and are not absolutely reliable. Even veteran observers don't rely on one attribute alone, but rather a combination of characters. Of course, the closer an observer is to the bird, the easier it is to make the identification. 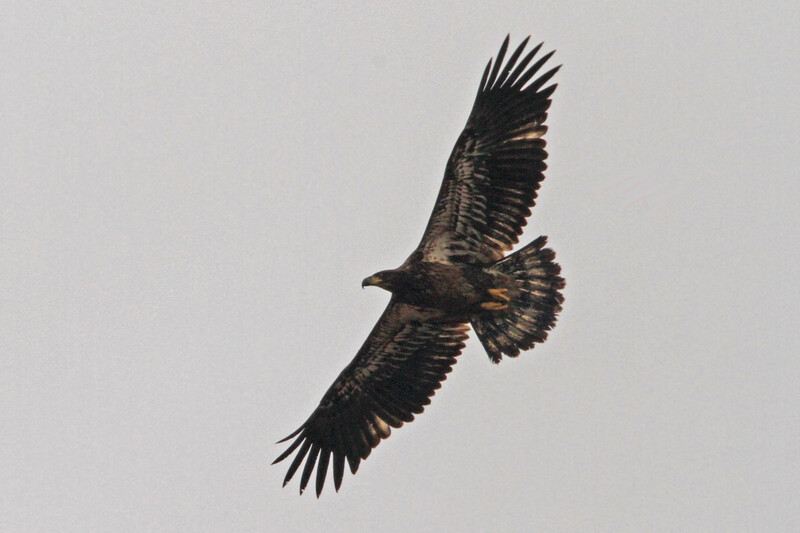 Adult: Uniformly chocolate brown with broad wash of golden-yellow from the rear crown across the nape—hence the name "Golden" Eagle (Figure 24). 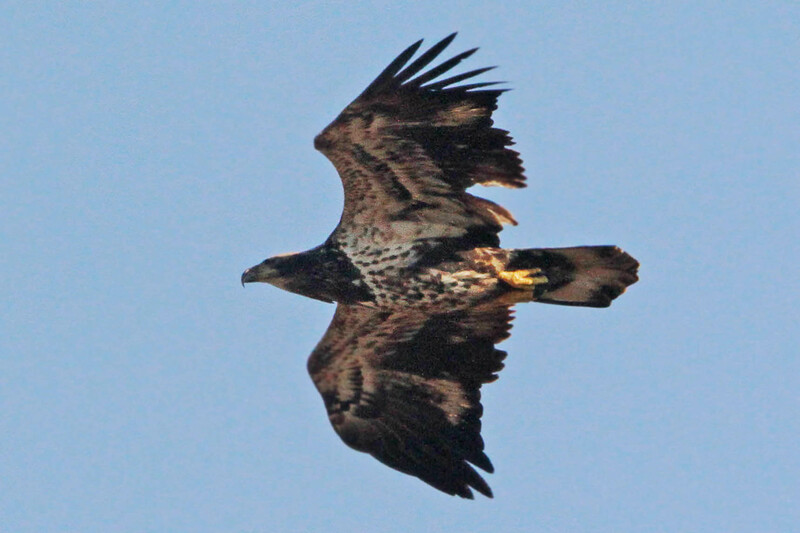 From beneath, the tail shows irregular lighter brown bands (Figure 25) which is reminiscent of the tail pattern in a first cycle Bald Eagle (Figure 8) but in Golden Eagle, the wing linings are darker than the flight feathers—opposite that of first cycle Bald Eagle. At very close range, the bill is dark gray with a yellow base (cere) and tarsi are feathered to the toes. 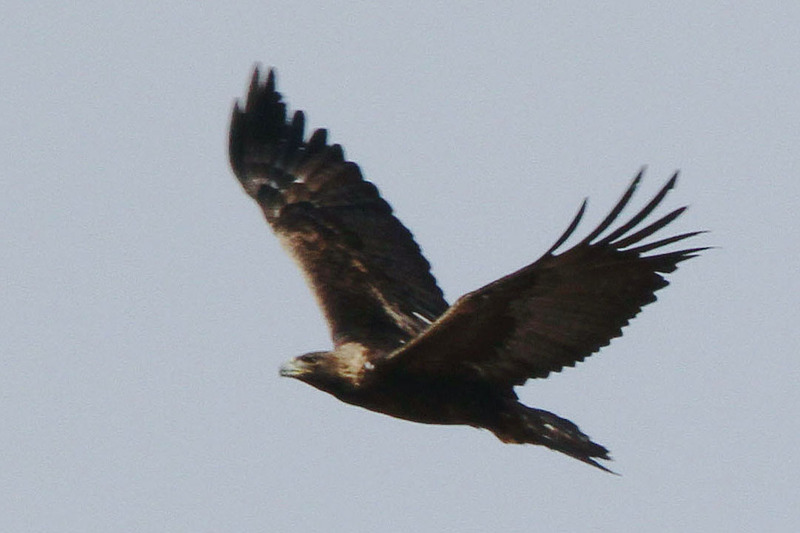 Immature (here referring to birds from juvenal through about second cycle plumage): Compared with adults, young birds average darker brown and the golden hackles (nape) are duller. However, the most striking feature is a bright white tail with a dark terminal tail band and broad white under-wing stripes formed by white bases to all the flight feathers, the broadest extent being in the region of the inner primaries (Figure 26). 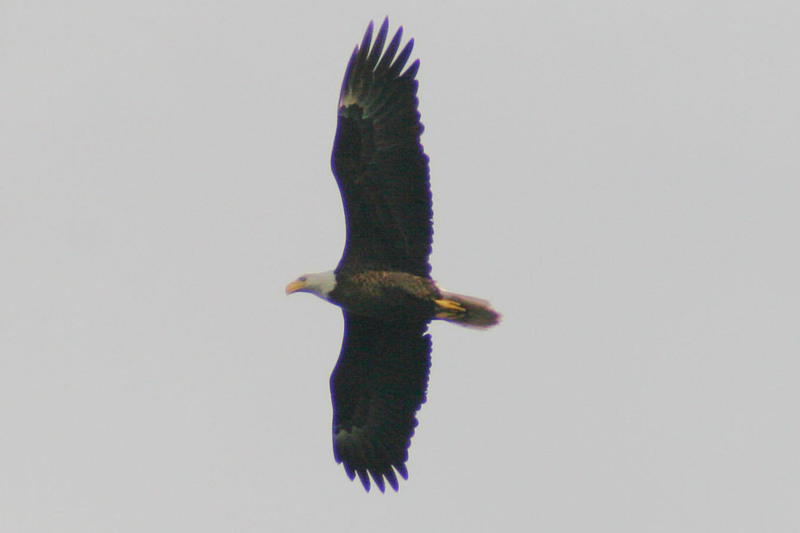 Although first cycle Bald Eagles also show white in the under-wing and tail, the pattern is completely different. Golden Eagle tails are brilliant white with a sharply demarked terminal band covering the distal half to third of the tail. Bald Eagles, at best, have a salt-and-pepper pattern. Similarly, the white of the under-wing in Golden Eagle is bright and located at the base of the flight feathers (Figure 27) whereas with Bald Eagle, it's salt-and-pepper and located in the underwing linings (Figure 8). 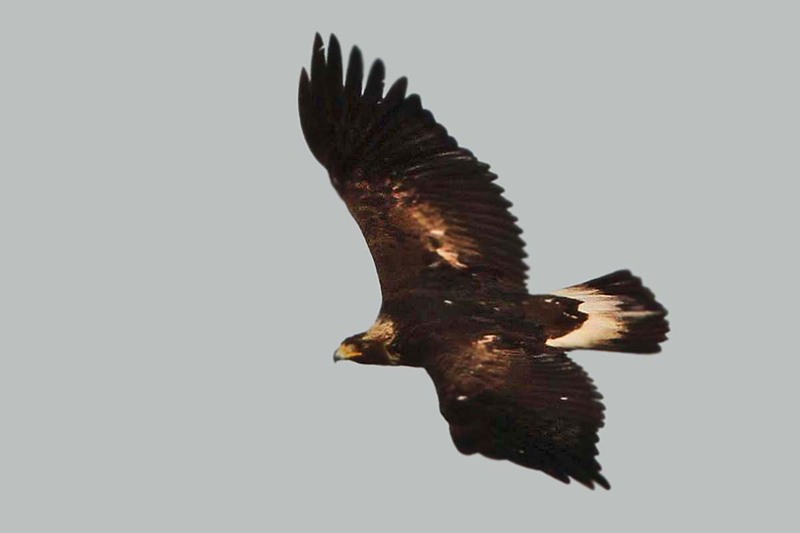 With Golden Eagles, the white bases of the inner and middle primaries shows through as a white wing patch on the upper surface of the wing (Figure 26) which is lacking on Bald Eagle. Sub-adult (here referring to birds in third through fourth cycle): Essentially sub-adults birds resemble adults (Figure 28) except that they retain the white tail band (Figure 29). 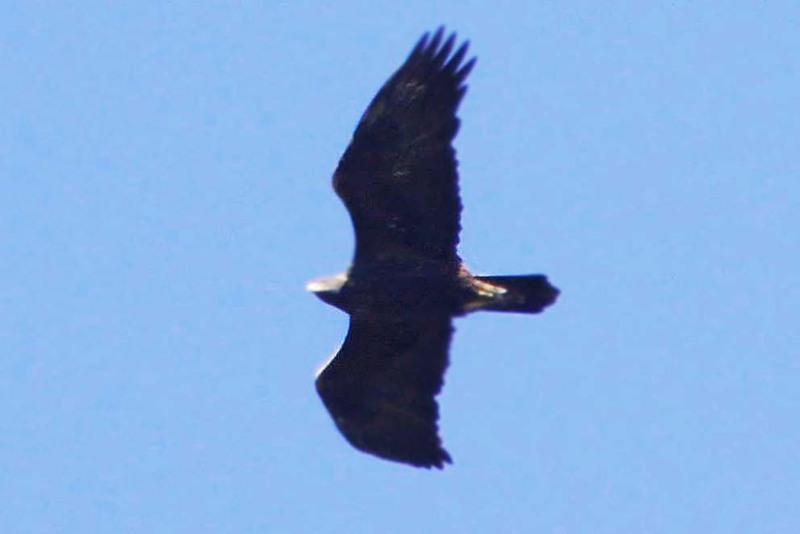 Essentially, any uniformly dark brown eagle (no white wing patches) with a bright white contrasting basal tail band is a sub-adult Golden Eagle. WHITE-TAILED EAGLE (Haliaeetus albicilla): This massive version of the Bald Eagle is a resident of northern Europe and Asia. While the probability of one occurring in the Carolinas is infinitesimally small, it's not zero. 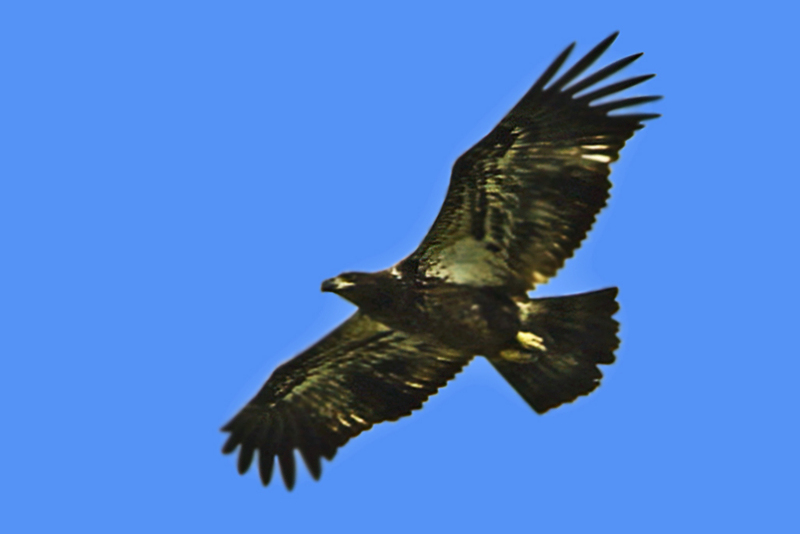 White-tailed Eagles have been sighted in Massachusetts, Connecticut and New York and the species has bred in Alaska. Overseas, repatriation programs, notably in Scotland and Ireland, are resulting in a come-back. Moreover, owing to concerted conservation efforts, native populations in Greenland, Iceland, and Europe are growing. As such, the species may be on track to replicate the population resurgence of Bald Eagle in North America. For the sake of this magnificent bird, I hope so. On the other hand, the western European populations are predominantly non-migratory although in Siberia and northern Japan, they are. 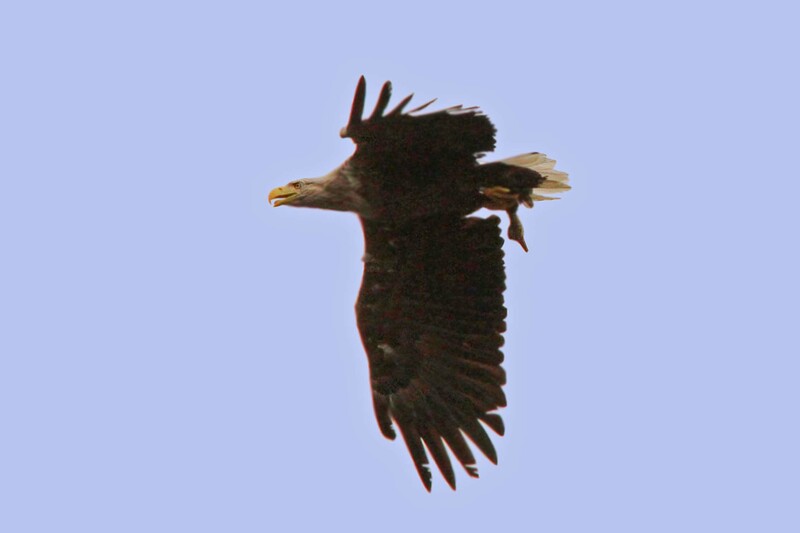 None-the-less, White-tailed Eagle is a species which ought to be discussed, if only briefly, just "in case." Compared with Bald Eagles, White-tailed Eagles are larger with wider wings that are sometimes likened to "barn doors." Their heads are proportionally longer and tails shorter and in adults, are distinctly diamond or wedge-shaped (Figure 30). 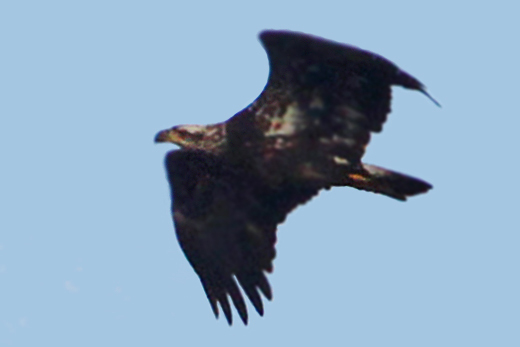 Adults have dark under-tail coverts whereas Bald Eagles under-tail coverts are white. Adult White-taileds have pale brown heads that progressively lighten with age but do not become pristine white as in Bald Eagles. As such, the head of a White-tailed would most closely resemble that of a third cycle Bald Eagle. In all ages, a White-tailed's body plumage averages lighter brown than a Bald's. Non-adult plumages progress similarly to Bald Eagle and a detailed comparison is beyond the scope of this article. The most consistent distinction is general size and shape. However, the tail feathers of immature White-taileds are distinctive in that each feather is extensively white with a point of white intersecting a broad dark border. White-tailed Eagles are fond of large bodies of water and should one ever occur, it would most likely occur along the coastal waterways where there are concentrations of large fish and waterfowl.